WHERE ABOUTS? 10 min drive north from Ullapool on A835, passing Ardmair Crags and Evening Wall on the way. A north west facing crag at 200m altitude and lies below the summit of Beinn Dearg 278m near the Dam Lochs. PARKING? Limited parking on eastern verge of A835 north of the Glutton straight at MR138000. If approaching from Ullapool, it is recommended to drive 1km further to turn in a road end instead of trying a death defying 3 point turn in the main road! Park well off the road – worn area on verge. THE APPROACH? 20 min walk up steep ‘vertical bog’ hillside following vague path and marker wands – wear ‘Scottish Approach Footwear’, aka wellies, or good walking boots. The approach is through a recently planted native woodland – beware of ‘mantraps’ filled with water! WHAT LIKE? The situation is open, exposed and the views from the crag are stunning. Make an effort to walk up to the summit of Beinn Dearg for the full 360° mountain panorama! The right side is very steep, dries quickly and comes into sun early/mid afternoon. The left side is less steep, more featured, can seep in places after prolonged rain and remains in shade until late afternoon. AND THE CLIMBING? 24 routes to date (June 2013), grade range from 5 to 7c and from 6m to 18m in height. Steep rough Torridonian sandstone - climbing similar to nearby Ardmair crag, so brush up on burly technique including jamming! All routes cleaned and fully bolted using 12mm ss expansion bolts with petzl hangers with a range of 3 to 7 bolts per route. As an interim only, the lower off bolts are centralised with rope and are equipped with a single karabiner or maillon – please leave in place. Beware of rope abrasion and rope jamming in cracks when lowering. MIDGES / TICKS? Since the crag is exposed to most aspects, there is usually a breeze to keep the midges down. No ticks as yet, but will be present in the longer vegetation. HISTORY? Driving south on the A835, the crag is obvious on the skyline from the Strathcanaird brae and it has been visited on many occasions over the last quarter century including a sortie by Allen Fyffe and Andy Cunningham in 1990. It was dismissed then as too short and too much cleaning to produce worthwhile trad routes, and anyhow, the Ardmair and Keanchulish crags are close by and were being developed in the late 80’s and nineties. Rab and Chris Anderson, and local climbers Lawrence Hughes, Ian Taylor and Tess Fryer visited the crag on later dates and came to the same conclusion. 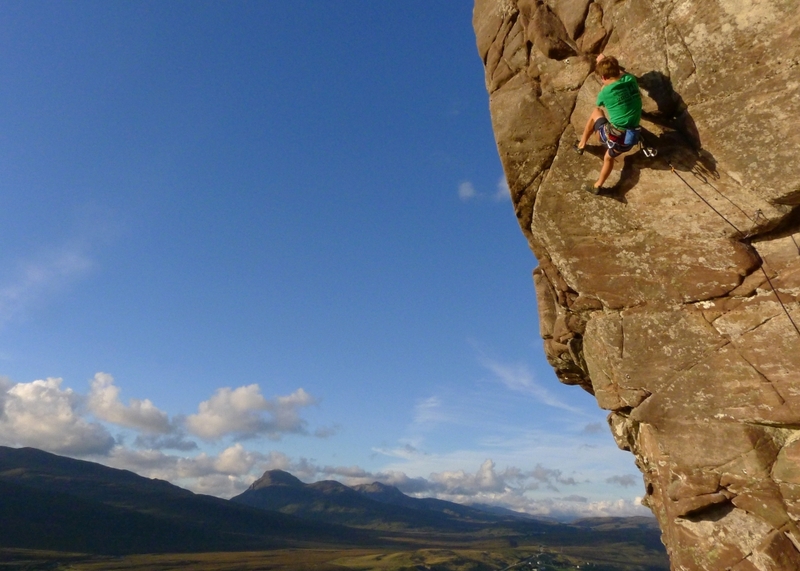 With the development of sport climbing around Gruinard, Gairloch and Inverness, locals revisited Glutton with a sport head, but again decided it would be difficult to develop and be at the limit of accessibility for a sport crag. With pressure from his children to conjure up a local sport crag for after school workouts, Andy Cunningham visited the crag again (for the fifth time!) in January this year (2013) and after consultation with local climbers, he decided to invest energy (and his kids pocket money) developing the crag as the first Ullapool sport climbing venue. The rest is history.